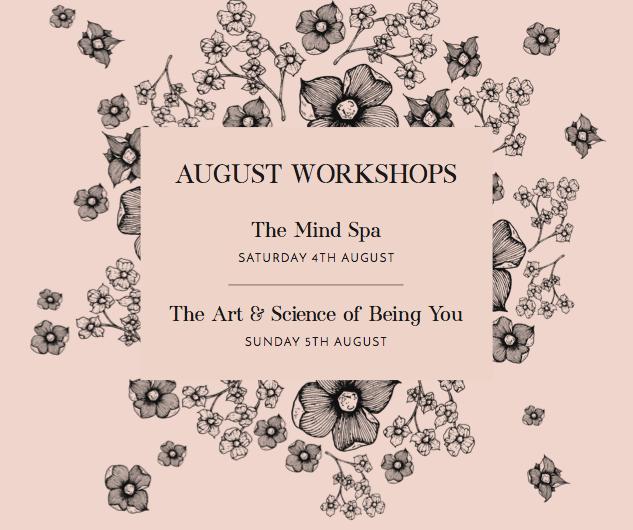 Coming up next month we once again have the new and improved MINDSPA on the 4th August and also the ART & SCIENCE OF BEING YOU on the 5th August. The MINDSPA is what I call a light skip across some very deep concepts. What it's really about is revitalising our minds to access more of our inner beauty and inner wisdom. We are all familiar with the terms associated with going to the spa..but how many of us actually relate this to our minds directly. Exfoliating and repairing and renewing our minds can be just as beneficial as our skin. I know that our beliefs and perceptions will age us way faster than any outside influence. We are that powerful. Give yourself a day to come along and find out how the Mindspa is an essential component to your well being. We are running these workshops one after the other so you can make yourself a real priority this weekend. Spend one day on you and then one day on your relationships. The ART & SCIENCE OF BEING YOU is teaching you the science of transformation that you can apply to any challenge that you may have. This is an incredibly interesting course that delves deeper into the energy of the universe, and perhaps more importantly teaches you how to apply this knowledge to a current situation in your everyday life, and ultimately to the relationships that you would love. Give yourself a day to clear some baggage and be inspired by your own magnificence.